Ben-Dor, Oren. 2000. Constitutional Limits and the Public Sphere: A Critical Study of Bentham's Constitutionalism. Oxford; Portland, Ore.: Hart. "Bentham, Jeremy." The Internet Encyclopedia of Philosophy. Available online at <www.utm.edu/research/iep/b/bentham.htm> (accessed May 7, 2003). Burns, J. H., and H. L. A. Hart, eds. 1970. "Jeremy Bentham." In An Introduction to the Principles of Morals and Legislation. London, England: Athlone. Engelmann, Stephen G. 2003. Imagining Interest in Political Thought: Origins of Economic Rationality. Durham, N.C.: Duke Univ. Press. Kelly, Paul Joseph. 1997. 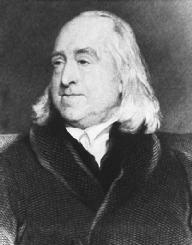 Utilitarianism and Distributive Justice: Jeremy Bentham and the Civil Law. Oxford: Clarendon.